Black History Month: What's your advice for the next generation in the Faculty of Medicine? For Black History Month, the University of Toronto's Faculty of Medicine asked members of its community to share their advice for the next generation of Black students who are interested in clinical or research careers. Josiah Osagie is a fourth-year student in the MD Program. The first and most important thing is to recognize the validity of your desire to become something in this world. You must have noticed by now that not many people in your classes – students and professors – look like you. Do not let this dissuade you. Connect with students who are like-minded and as driven as you are. It is vital to surround yourself with people that push you to be better. Take advantage of the resources available to you, for they are abundant. It is essential to engage authentically with the community around you: join a student association, volunteer at a library, advocate for something you care about. Don't do so simply for your CV or medical school application – although these are important – but because connecting with community enriches you. It gives value to your life and purpose to your work. Finally, be bold. You are capable, intelligent and industrious. Go forth and show it to the world. Diandra Benjamin is a Master of Health Science candidate in the department of speech-language pathology. Growing up in the Caribbean, I observed that a career in health care typically translated to the traditional careers of “nurse” or “doctor” – rewarding professions in and of themselves. As I began to consider a career in health care, I ran the risk of being pigeon-holed. Through the years, I have come to know the incredible range of health-care careers that tap into various personalities, interests, and client populations. I encourage those considering health care as a career option to venture into the unknown! How? The value of networking cannot be understated. Networking is an opportunity to build connections with professionals in your field and tap into opportunities that are simply amiss in the classroom. One of the additional benefits of networking is finding a mentor: someone that has stood in your shoes and can offer support to help you scale the ladder to success. In my experience, I have also observed that Black students in health fields are sorely underrepresented. Truth be told, you may find yourself to be the only one that looks like you. At its surface, this can be an unsettling reality. However, be assured that your presence is of value; your voice is of value. Diversity fosters open dialogue between people of many different backgrounds to yield enriching educational experiences. I will always remember the moment a little girl at my clinical placement beamed and said, “you have the same skin as me!” To this day, I cannot fully appreciate what the simple observation meant to her, but I can appreciate that my presence was meaningful – and that I will always treasure. Ikran Ali is a master's of science candidate in the Institute of Medical Science. Seek out research opportunities (research positions, scholarships, grants, funding) as soon as you can. Don’t be afraid to reach out to professors, mentors and other students for advice or guidance. People are usually willing to help – a simple email can take you a long way. Also, don’t be too shy to follow up. Sometimes people are busy and forget to get back to you or they missed your email. Make sure you volunteer and join committees to meet other people and learn about events or programs that can help you excel in your career. Tarimobo Otobo is a master's of science candidate in the Institue of Medical Science. Fundamentally, you will have to love your choice. Challenges are unavoidable in any chosen career and at difficult times, your passion will be the source of resilience. Your personal interest and desire expertise because of your interest and passion for inquiry and ingenuity to add to the body of knowledge. All facets of medical sciences are important and complementary. A successful career will be dependent on how successful you become in your chosen area of expertise because of your interest and passion for inquiry and ingenuity to add to the body of knowledge. Most important – and perhaps often neglected – is the leadership and mentorship you receive. In my career experience, I have seen promising dreams being threatened by challenging mentorship and leadership, and unpropitious personalities excelling in their career because of good mentorship and leadership. Therefore, I can’t emphasize enough the need to identify a mentor early on as a role model and explore possibilities of mutual benefits and compatibility. Finally, hard work makes geniuses. A guided effort with diligence will result in a successful career. Telisha Smith-Gorview is an emergency medicine physician in the University Health Network and an assistant professor in the department of medicine. There is a false perception in some parts of society that Black students are less able or less capable, so believe that you also have the ability to succeed. Ask lots of questions, reach out to groups like Community of Support. It'll take hard work – and then some harder work – but if pursuing a career in medicine and/or research interests you, go for it and see where it takes you! Lina Elfaki is a master's of science candidate in the Institute of Medical Science. One piece of advice I wish I knew earlier in my studies is to be wary of other people’s advice! Yes, seriously! Often, you may be one of a few Black/minority students in your course, lab or even program, so others may not sufficiently appreciate your experiences or struggles. Thus, their advice may be irrelevant to you and you need to take it with a grain of salt. Instead, find supportive mentors and allies who you trust in your field(s) of interest who can offer constructive criticism. Personally, I have often been deterred by friends or supervisors who underestimated my perseverance. 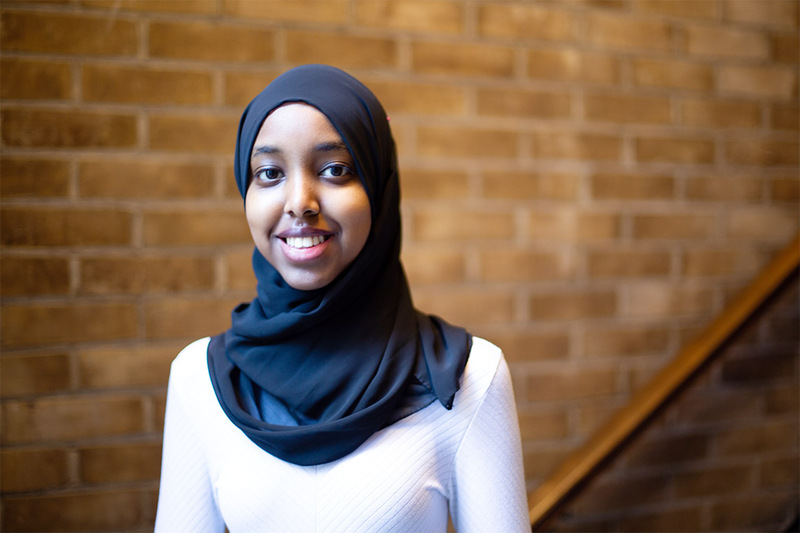 However, through my undergraduate studies, I learned to appreciate my unique strengths and how my privilege to attend an elite institution like U of T requires me to create inclusive spaces for other minority students. Therefore, when looking for a research supervisor for my graduate studies at the Institute of Medical Science, I made sure to choose a supervisor that not only cultivates my research advancements, but also encourages my personal career progress. Thankfully, Dr. Howard Leong-Poi has incredibly supported me, both academically and personally. Aisha Lofters is an assistant professor and clinician scientist, in the department of family and community medicine. She is also a provincial primary care lead for the cancer screening portfolio at Cancer Care Ontario. Don’t be afraid to toot your own horn. A lot of research is about convincing others how good you are. Convincing them that your idea should be funded, that your salary should be funded, that you should be hired for this position. Often, we are taught that we must be humble, or we don’t have the same supports as others do reinforcing how successful we have been. But this is the time to celebrate your accomplishments. Be confident, tell them why YOU are the best one for the role, why YOUR idea is the best one for the funding opportunity. Don’t sell yourself short; others might so you can’t afford to!